Diving fins are the single most important piece of diving gear when you consider all the aspects to which they contribute. Since your feet are the single most active part of your body when scuba diving, providing the propelling force via kicking that enables you to move about, the efficiency and functionality of your diving fins makes a huge difference in how much you can explore underwater in a single dive. Having a poorly-designed set of diving fins can lead to a miserable experience underwater; sore legs and a smaller amount of exploration are the rewards of making such a bad decision. During the exploration of various sets of diving fins, a particular set of US Divers fins stood out for a number of reasons. US Divers has been in business for over half a century and has perfected many different products by using a combination of research, development and dedication. The product in question today is the U.S. Divers Proflex II Diving Fins, which has enjoyed numerous glowing customer reviews and has a very reasonable price tag attached to it. We hope to give you the low down on these fins to help you decide whether to purchase them or not. 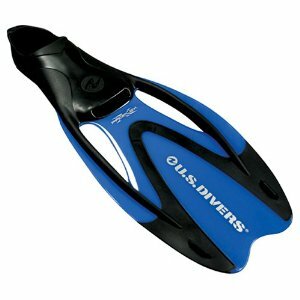 These US Divers fins are very flexible and do not rub against the feet or leave any painful blisters. The snap and thrust is especially good too considering the low price of $20. While these are not the lightest pair of fins the moderate weight does find a nice middle ground between energy use and speed. This fin works especially well when snorkeling and is flexible enough to be bundled up and stored in a day pack or other bag. The snug fit works differently than some other fins that secure with a strap around the heel; these fit more like a shoe. When it comes to complaints, there are a few in regards to the U.S. Divers Proflex II Diving Fins. Many users report that the fin sizes run small; so we suggest buying a size up from your normal shoe size. While the flexible design helps to prevent tiredness, the speed that is achievable with these US Divers fins is reduced due to this design, in conjunction with the holes in the middle of the fins. When considering a new set of fins to use for leisure diving or snorkeling, these US Divers fins are a great investment. Very rarely does a piece of diving equipment at such a low price get so many great reviews and this is a testament to the great design on behalf of U.S. Divers. For less than the cost of half of a tank of gasoline, you can be propelling yourself through the water instead of on the streets. This entry was posted in Fins, Reviews, Scuba Diving, US Divers and tagged Dive Fins, Scuba Diving Equipment, US Divers. Bookmark the permalink.